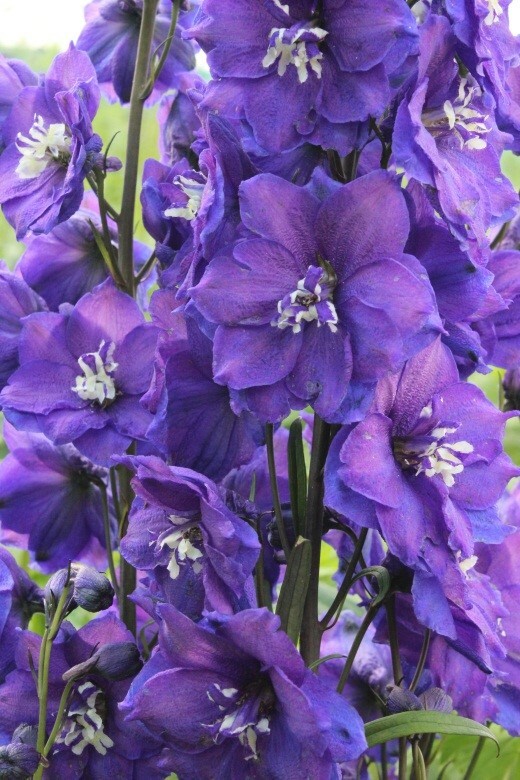 Delphiniums are one of the classic summer flowering border plants. 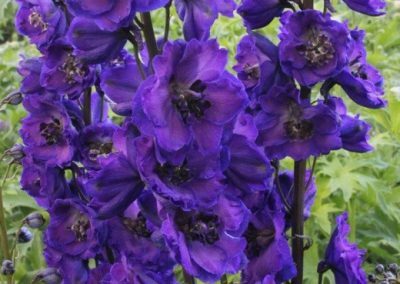 Unmistakeable in appearance, the towering spires of Delphinium rise above neighbouring plants, lending an air of stately poise to any area. 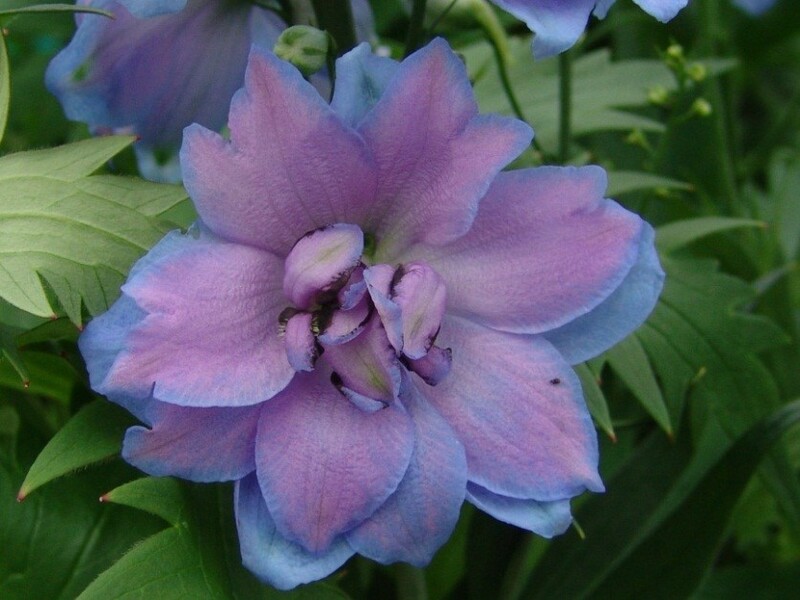 Delphinium is an elegant perennial, which makes the garden truly splendid. Every year they astonish you by their regal colours and elegant stature. 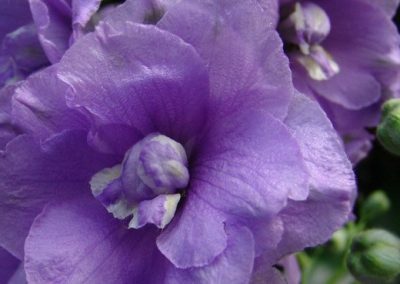 They come in an array of beautiful colours but are most famous for their astounding blue shades, from the deepest navy through almost black, lively kingfisher blues, cool and tranquil silvery lavenders and sky blues, but they also come in white and several pink shades from lilac through strawberry rose and mulberry. Many varieties have a contrasting ‘bee’ or middle in the centre of each flower, which can be black, silvery grey or white. 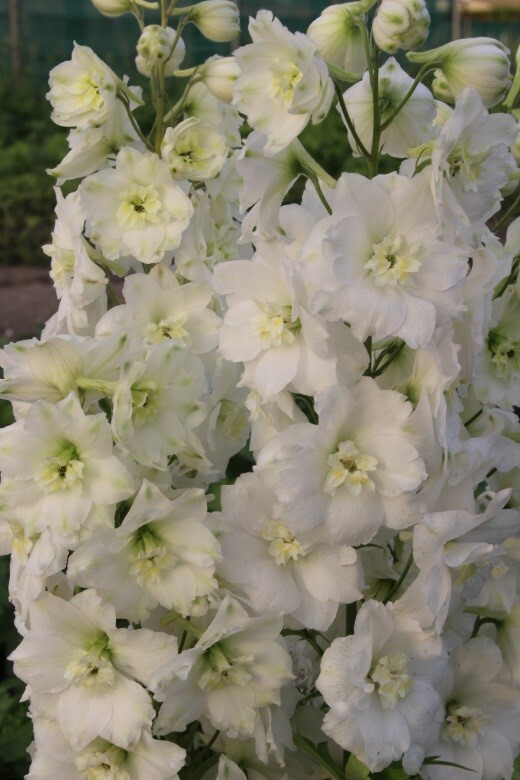 Delphiniums peak bloom period is early to midsummer and may continue late into the fall. 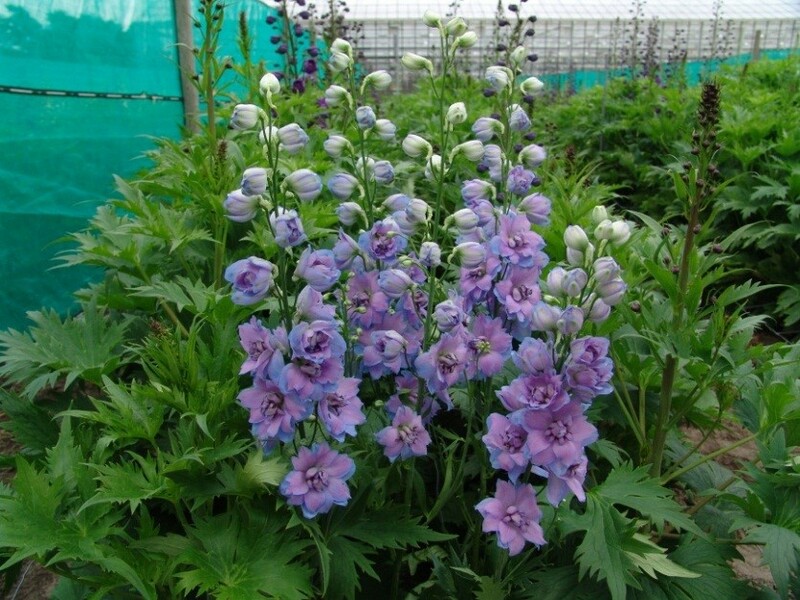 Delphinium is extremely hardy and are one of the easiest plants to grow. Even when planted in a less than ideal spot and never get around to pampering them, they still thrive and bloom wonderfully. 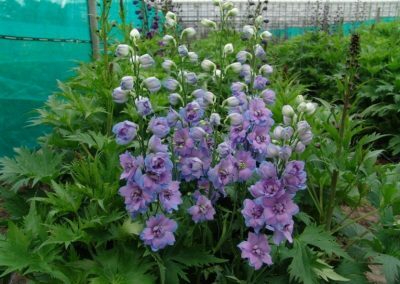 Delphiniums of all descriptions are very worthy garden plants and the greatest majority of the time it is the seed raised strains that are offered. There is nothing wrong with such plants. They tend to represent very good value. 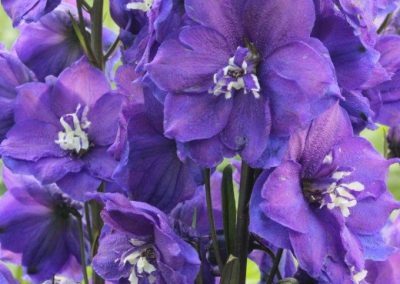 But there are also a great number of vegetative propagated named varieties that perhaps represent the pinnacle of the Delphinium grandeur. 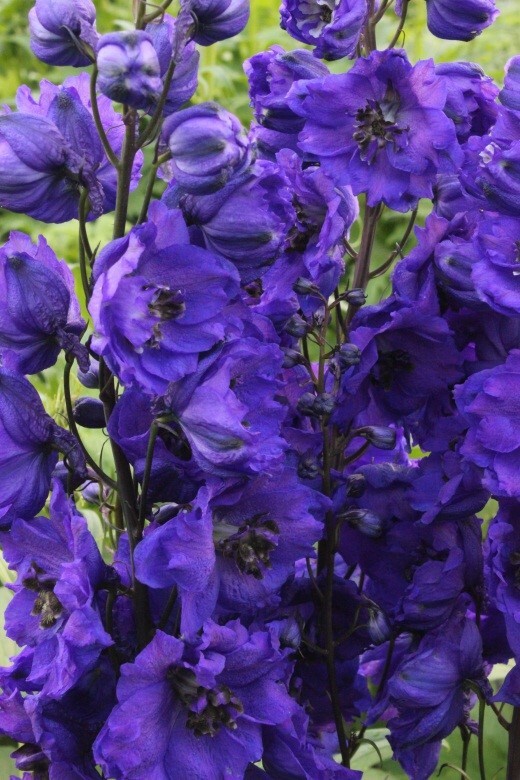 These varieties of Delphinium are much less often offered but their unique beauty is exactly replicated and maintained. 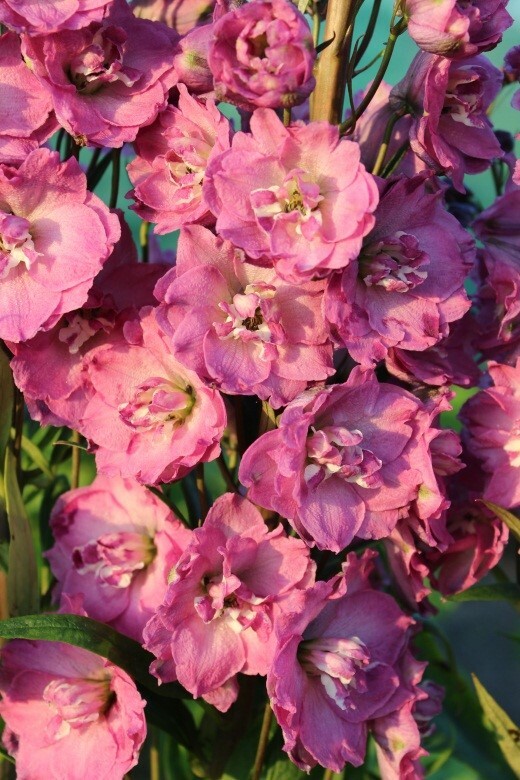 The better named varieties often re-bloom. 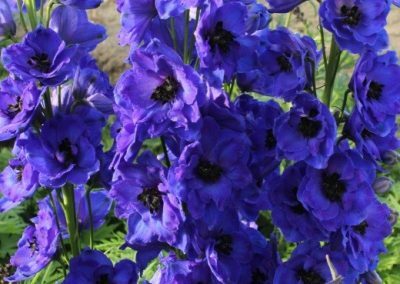 They are aristocrats of pure indulgence, and make sparkling plants for the border. Towering spikes clad in colourful florets are borne throughout the summer months. 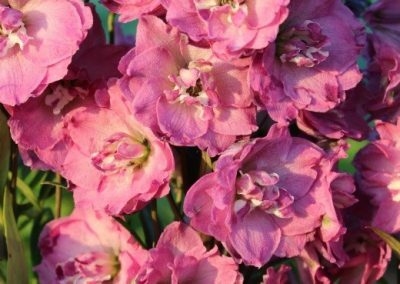 Over the past 100 years, a great deal of hybridizing has been done, resulting in a long list of varieties. 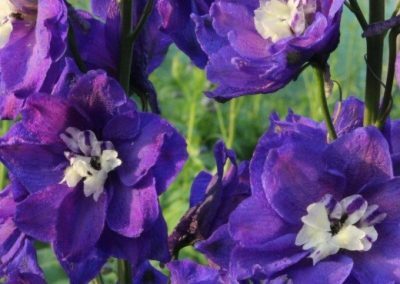 The German breeder Karl Foerster became world-famous for his Delphinium breeds in the early twenties of last century and although some have sadly been lost, a great many remained. 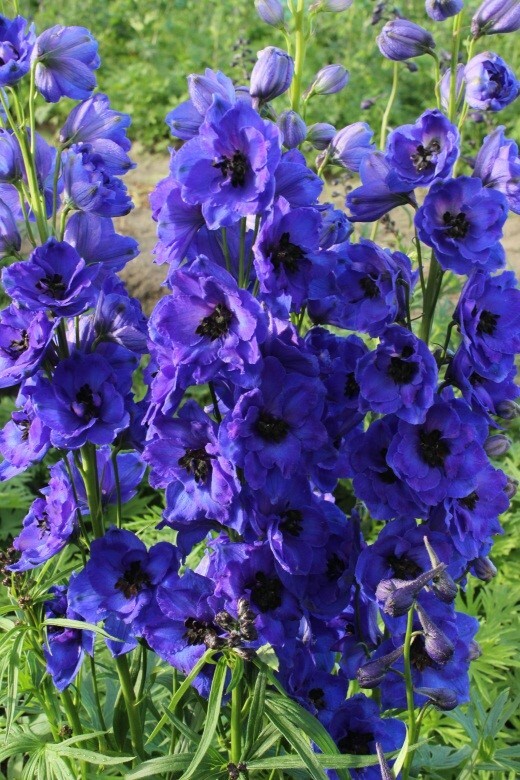 Karl devoted the bulk of his life to the task of trying to create new and improved perennials under which Delphinium. 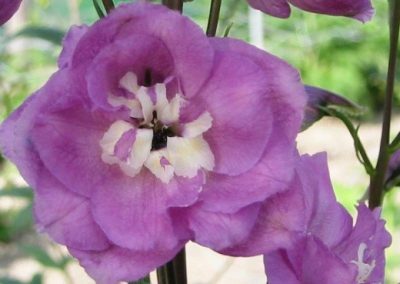 Many to date Delphinium breeders could not become so successful if they were not standing on the shoulders of Karl Foerster and his success in breeding Delphinium, Dutch breeders included. 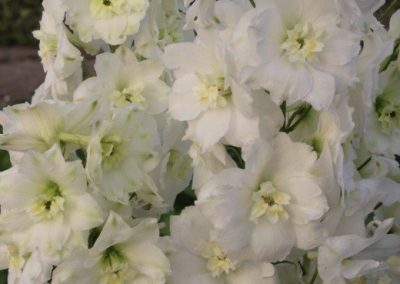 The Dutch, highly valued and recommended Delphinium Delphi’s®Series® is a good example of top hybridizing work in Delphinium. This Series distinguishes itself from common varieties by showing some unique characteristics. They have multi-coloured bees(centre). 2-3 different colours. 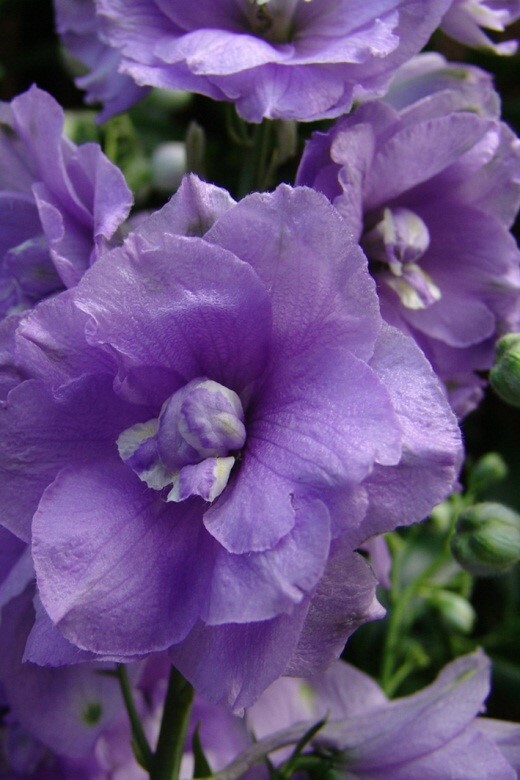 The entire stem on all sides is covered by double-layered densely packed, individual flowers. The stems are not hollow, but sturdy and fleshy. The dark-green leaves are not hanging down but stay upright along the stem. 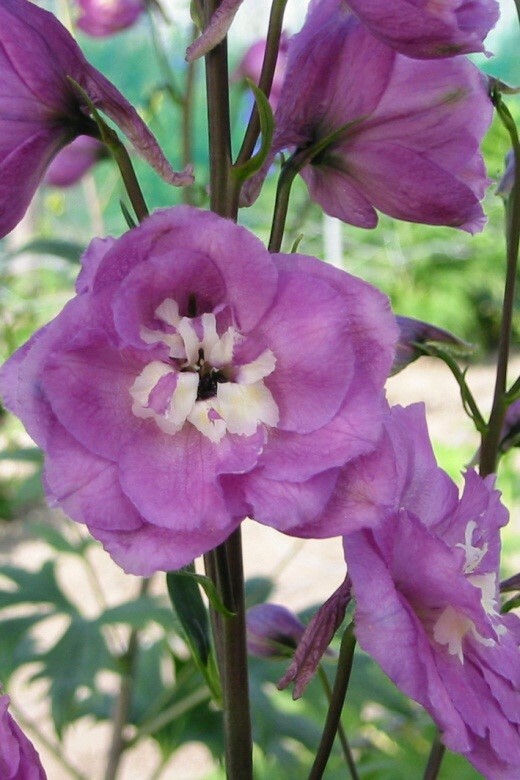 The maximum length of the stem is 100cm and does not require staking. Delphi’s® Diamant; Delphi’s® Hollands Glorie; Delphi’s® Emerald; Delphi’s® Jewel; Delphi’s® Misty; Delphi’s® Pink Power; Delphi’s® Power; Delphi’s® Saffier; Delphi’s® Secret; Delphi’s® Starlight. Others will follow the coming years. 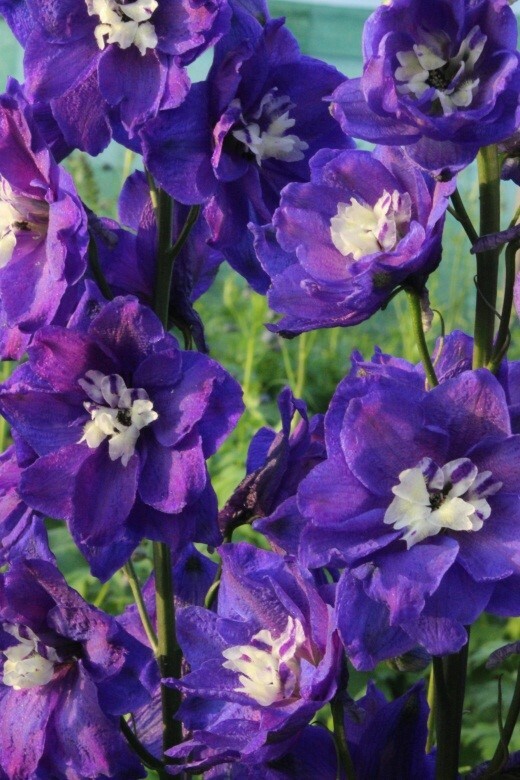 Delphiniums reign supreme in the summer border. 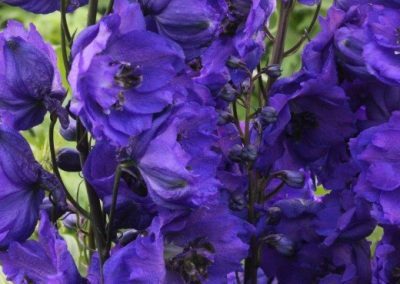 The beautiful colours and striking vertical habit of Delphinium add drama to the mixed borders. 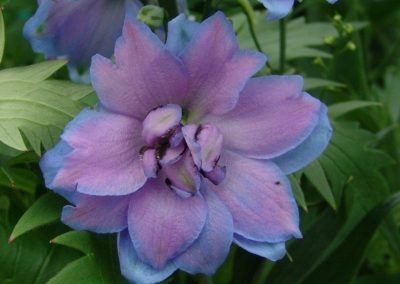 Delphinium thrive in any ordinary garden soil. A sunny spot suits them best although part shade is tolerated well. 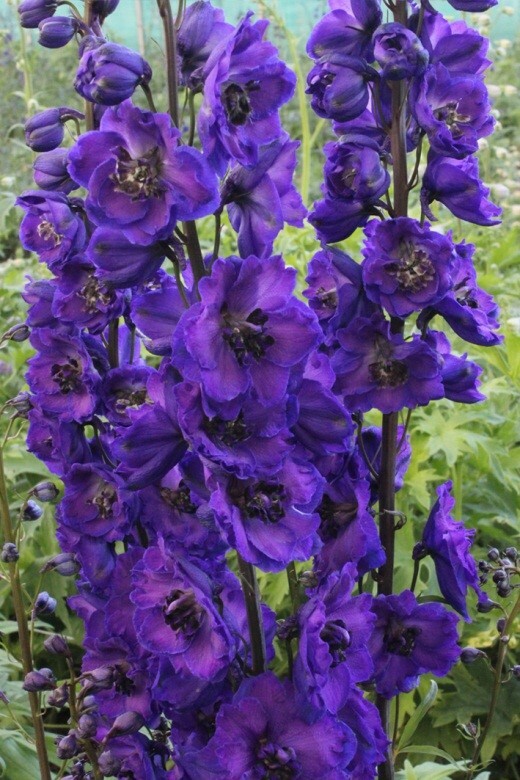 Delphiniums stand out in the garden like rockets or fireworks that have left their blazing trail standing in the air, the most vigorous and meaty verticals the summer garden can provide. Their gorgeous blooms also make outstanding cut flowers.